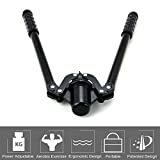 Are you still using single bar with risk of danger arm exerciser? Not like “spring” power bars, you don’t need to buy new ones when your strength level increases. It have minimum 5 to maximum 60kilogram resistance. Lower level is design for woman and warm up step. If you are super strong you can challenge heavy duty as the 60kilogram level. Adjust the heavy level with the rotating Knob from Easier to Heavier.